Become A Member! Renew Your Membership! 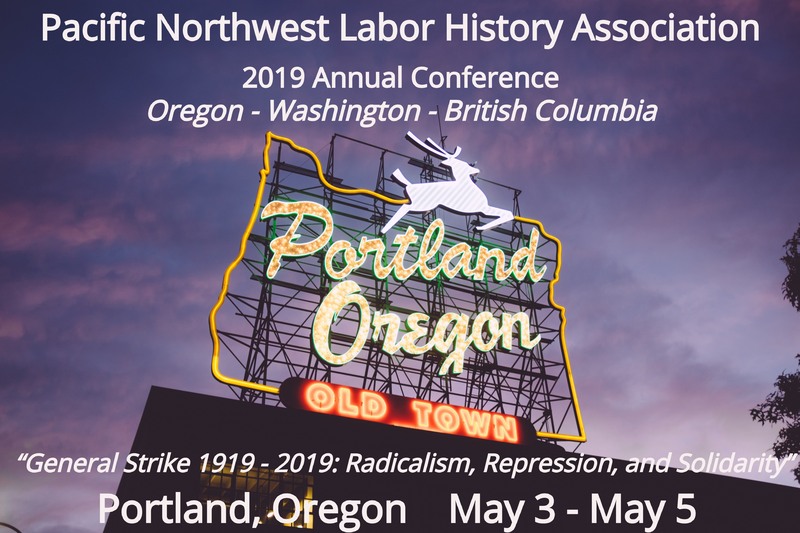 Come, share, and celebrate labor history at the 2019 Pacific Northwest Labor History Association conference at the Portland State University Conference Center and Hotel on May 3-5, 2019. See program brochure for complete details on how to register and a list of panels. Register early to take advantage of the fee discount and save your place at the Saturday banquet. 2019, our Solidarity Centennial, marks the 100th anniversary of a watershed year in American and Canadian labor history, especially in the Pacific Northwest. The year was defined by the Seattle and Winnipeg General Strikes, the Centralia Massacre, and the wave of state sponsored repression of immigrant workers during the Palmer Raids. Reflecting on these events, a century later encourages us to consider the significance of labor radicalism, as well as ways that organized labor has both enforced and overcome racial and gendered barriers to solidarity. The PNLHA values intersectional approaches to working class history. Our 2019 conference includes exhibits and performances of art and music that reflect working-class culture and history. There are many inspirational speakers, panels and presentations using non-traditional, popular education approaches, with apparent current relevance. Please note that you can also register by mail or email: Registration by Mail Conference Form. Send your registration details to PNLHA, 715 Ellsworth St., Eugene, OR 97402. For more information contact Ron Verzuh, Oregon past-V.P. PNLHA – 541-852-5540. Every two years we nominate and elect our officers and trustees. The elections are held in relation to our annual conference, which this year is May 3 – 5 in Portland. The officers of PNLHA are: President, Oregon Vice-president, Washington Vice-president, British Columbia Vice-president, Secretary, Treasurer USA, and Treasurer Canada. Nominations for these officers were held between 60 and 30 days before our general membership meeting which will be held May 5th immediately after the conference and are now closed. There are three or more trustees for each of our three areas. Nominations for trustees will continue up to the membership meeting at which time we will have that election. 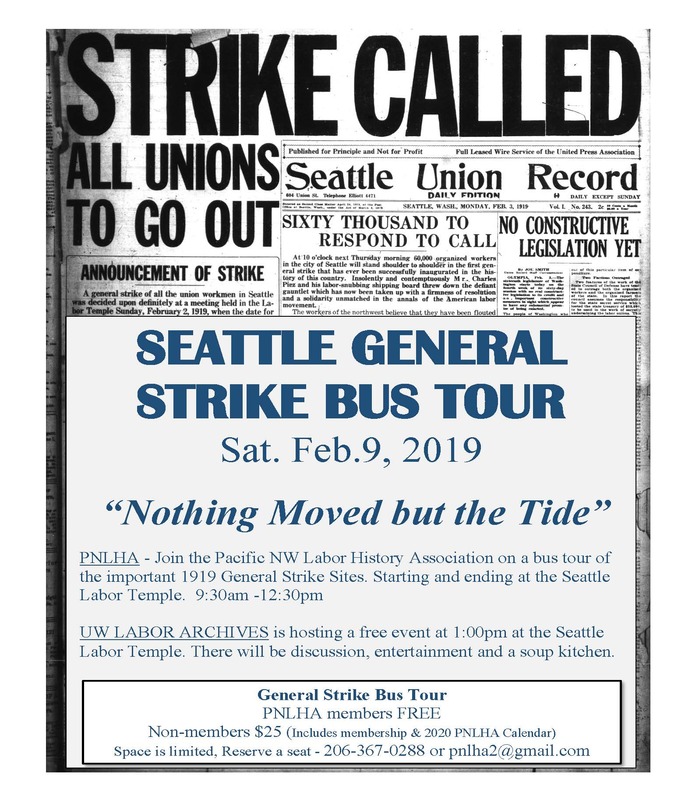 Join the Pacific Northwest Labor History Association (PNLHA) on a bus tour of the important 1919 General Strike Sites. Space is limited, reserve a seat by calling (206) 367-0288 or emailing pnlha2@gmail.com. 2019 marks the 100th anniversary of a watershed year in American and Canadian labor history, especially in the West. The year was defined by the Seattle and Winnipeg General Strikes, the Centralia Massacre, and the wave of state sponsored repression of immigrant workers during the Palmer Raids. Reflecting on these events a century later encourages us to consider the significance of radicalism as well as ways that organized labor has both enforced and overcome racial and gendered barriers to solidarity. The PNLHA values intersectional approaches to working class history. We especially encourage exhibits and performances of art and music that reflect working class culture and history, and non-traditional, popular education approaches. Presentations should be addressed to a broad range of conference participants includng academics, students, workers and community members. Over a hundred attendees were at the Pacific Northwest Labor History Association’s 50th Anniversary celebration in 2018 on April 6 – 8, 2018 at the Hilton Seattle Airport & Conference Center in SeaTac, WA. Highlights included a myriad of workshops and keynote speeches by Nikkita Oliver, Bill Fletcher, Jr., and Kent Wong. The Hilton has offered to lower the guest room rates from $149 + taxes to $113 + taxes. Take advantage of this new lower rate for the Labor History Conference before March 16th. If you have already booked your room your rate will be decreased to $113 + taxes. SELRES_1c17eae8-88d1-40ac-bfb4-de760f579754SELRES_1f4bf0a0-4583-4d32-a7a2-c63da1a76700The Hilton SeaTac has agreed to a new, lower price for guest rooms for the PNLHA Labor History Conference. The original rate was $149 + tax and now is $113 + tax per night. Please reserve your room before March 16 to ensure the reduced rate. If you have already booked your room at the original rate you will be charged only the new $113 + tax rate. You are invited to the Pacific Northwest Labor History Association’s Annual Conference and 50th Anniversary celebration! Our conference will be April 6 – 8, 2018 at the Hilton Seattle Airport & Conference Center in SeaTac, WA. Registration includes a Friday night social and movie co-sponsored with the United Association of Labor Educators (UALE). This year’s conference promises to be one of our best. We have two dynamic keynote speakers in Bill Fletcher Jr. and Kent Wong. Saturday evening we have our Annual Awards Banquet where we honor our own who are making labor history today. The featured speaker will be Nikkita Oliver, organizer, educator, teaching-artist, social justice activist. We have sixteen excellent workshops as well as three movies: we are collaborating with UALE in premiering the new film 9to5/925 Legacy which looks at the 40 year history of the National Association of Working Women and its sister union, SEIU 925 based in Seattle; Witness to Revolution on the 1919 Seattle General Strike; and the just-released Verona which explores the events surrounding the Everett Massacre. The PNLHA brings a history of struggle for labor and human rights to the forefront of our consciousness. For fifty years, we have explored regional, national, and international issues, and used music, drama and re-enactments, talks and papers to highlight labor history. In this era of disaster capitalism, we especially need to remember what working people and unions have done, and need to do, to make the world a better place. Registration fees include all workshops and plenaries. They do not include accommodations, meals or transportation. Conference attendees are expected to pay registration fees. Some Youth Scholarships may be available. Last year, the PNLHA distributed 8,000 calendars. Please consider joining the PNLHA in 2017 to reserve your calendar for 2018! 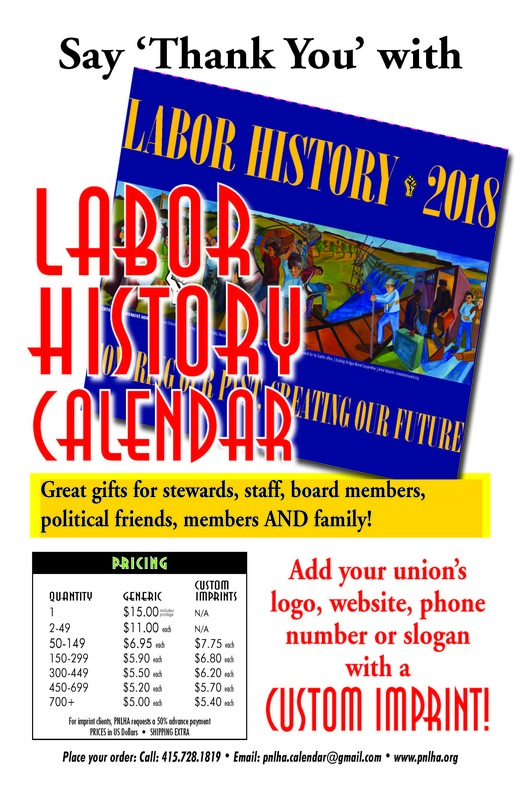 We are now taking orders for the 2018 PNLHA Labor History wall calendar, in its 39th edition, is the only regional labor calendar in the country and we are extremely proud of that! Last year, over 8,000 calendars were distributed and with your help we can accomplish this again. The 2018 calendar will include dozens of historical pictures as well as local union charter dates and major labor events. The PNLHA is a non-profit association of trade unionists, students, academics, and others dedicated to preserving the history and heritage of workers in British Columbia, Oregon and Washington.